New York, 2140. The waters have risen by more than 50ft but the submerged City is still going strong. 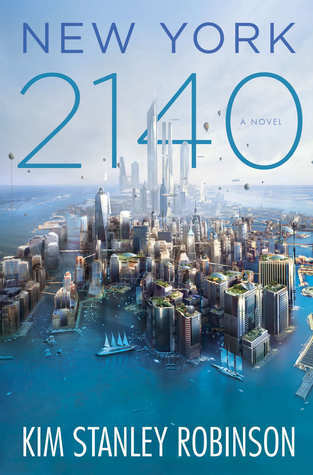 In this brilliant book, Kim Stanley Robinson explores an hypothetical future where the melting of glaciers and climate change completely reshaped the world as we know it. New York 2140 follows a bunch of characters all living in the Met as they slowly all meet thanks to a series of happy (or not so much) adventures revolving around the disapperance of two coders who may have try to shatter the world of finance. Yeah, just that. I can’t say that this book is very plot-driven; it is certainly centered around the disapperances of the two hackers but, it mostly remains KSR’s study of climate change and how humans could survive the mess we are currently making with our planet. I personally enjoy climate fiction since this genre allows me to see how our current actions could possibly influence our future and to see some solutions presented by the author. I like it when books are set way after a disaster because you can then see how the society was reshaped by this particular event. In this book, it was fascinating to see the ideas KSR came up with, both in terms of technical progress (seeing New York as Venice was very interesting, KSR imagined a city where bridges are connecting the different towers and everyone has his own personal boat and/or airplane) and finance’s evolution. In this world, the most important asset is real-estate particularly real-estate in the intertidal, a zone of New York where the buildings are partially submerged and the state of those buildings and the predictions of several agencies on their “health” is, of course, creating a new finance bubble. And bubbles like to pop. I will say it right now, this one isn’t for everyone, if you don’t care about New York or finance, this will probably bore you to death. I know some basic finance stuff (very basic but once upon a time, I wanted to work in the field, but that was before 2007, now it doesn’t interest me so much) and some passages completely went over my head. However, what really worked for me was the style of this book, it is written in a very peculiar way, some parts are only written in dialogues, some parts are 3rd person or 1st person and every few chapters, KSR has passages written by “a citizen” which are basically KSR’s free spaces in the book where he express his political opinions on finance and climate change. In those we often encounters extremely detailed en lenghty pieces on finance theory or New York’s history. Those parts are either going to make you fall in love with the book or despise it completely because they are quite info-dumpy and biaised. I have to say that some of “the citizen”‘s essays were a bit boring to me but for the most part, I enjoyed them and I found them interesting! Also, I really enjoyed reading about the majority of the characters and I really appreciated the fact that they all had distinct voices. I read Aurora by KSR earlier this year and I had a lot of issues with this book so I almost didn’t read NY 2140 but I am so glad I gave this author another go because this was amazing, it was dense but so clever, witty and a whole lot of fun and I will definitely re-read this book in the future! I also want to read his impressive backlist starting with the Mars trilogy! Highly highly recommended to cli-fi nerds. I don’t mind books reading about climate speculation, but I generally prefer them to have more story than exposition. Your comment about this one not being that plot-driven has kind of made me glad I passed on it. I don’t think I would have liked this one at all, especially since financial topics also me to tears too, lol.